Play nice. It's a dojo match, not a free-for-all. Even if you're fighting heavy, fight clean and show respect. Remember, what goes around comes around. If you're a senior and you're matched up with someone less experienced, offer suggestions when appropriate. You can do this even while you're sparring. Approach this in a way that is not belittling or condescending to your charge. Always keep moving. Never retreat in a straight line; use your angles and side-to-side movement (tai sabaki). Blocking should be regarded as a last resort. Instead, focus on making your opponent miss - then strike. If you must block, immediately counter with a strike. If you do get hit - hit back! Fully commit with your attack. Don't wade in with some half-baked move. If your opponent slips back and makes you miss, don't stop; keep going until you connect. Always follow through. This is the time to experiment. Try out something totally exotic, like a flying axe kick. Do it! Certainly there's more; this is a highly condensed list. Your own experience is vital. Remember that free style fighting is just a part of the martial arts. I find its most valuable aspect is that it forces the student to embrace spontaneity and uncertainty - something that cannot be derived from practicing forms, basics, or even self-defense. While the martial arts is a lifetime pursuit, understand that no one - regardless of skill or ability - can or should spar forever. Hajime! I was just talking to my instructor last night about sparring. To me it doesn't make sense if you study karate without it. Knowing kata's is one thing, but being able to actually implement and adapt them is what really counts from a self defense perspective. We were also talking about kata's and how at the level I'm at, many of them are starting without preps, just blocks. It's to be prepared to be taken off guard. I think the most important is being relaxed. It gave me an idea for post. Aspects of martial arts that I am improving by doing sparring. You can read it here. Sparring grandma, eh? That's rich. Say, that would make a nifty title for your blog in about 30 years! Thank you. And I appreciate the link-back from your post. You'll always benefit from sparring with people that have a variety of abilities and experience. You did point out something that I left out in my article: In tournament matches, all bets are off. 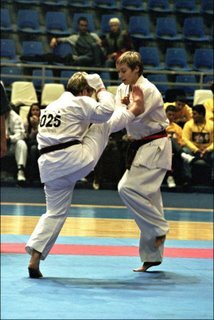 do you do bogu kumite in isshin-ryu? Bogu is kendo gear, isn't it? Shimabuku (Isshinryu's founder) advocated its use so trainees could go all out in sparring. I've also seen the wrap-around face shields (similar to kendo headgear) in boxing - not a bad idea for certain situations. I believe that my greatest problem in sparring is that whole idea of "relax". I found out that you cannot force yourself to relax. I can slow my breathing, and focus on calming, but then when my muscles relax they tend to lose that sharp alertness since my mind is busy putting all of my energy towards relaxing. I think that I will improve in my efforts to relax as I gain in experience. Please tell me that this is so.. Your ability to generate maximum power, speed and fighting effectiveness require a relaxed disposition. Anything else is illusory. "Efforts to relax" almost sounds like a contradiction of terms - but it does get easier as you gain in experience. Follow through. That seems to be the hardest thing for me and my daughter. We don't particularly like sparring so we want to get the point and get out. We are working on it! Get the point and get out. Sounds like "Do unto others and run", which is actually excellent strategy. Keep up the good work! being able to perform all your techniques and Kata's is great but once we are thrown into a simulated fighting situation such as sparring or kumite, we have all these new variables that constantly hinders our ability to perform fluidly. Your opponents resistence will upset your balance and techniques but this can be worked around through fixing and adjusting accordingly to the situation through gaining experience. Just using Visualisation of the opponent not enough.